Build a Robot that Reads Audiobooks or Speaks Your Tweets Aloud @Raspberry_Pi #piday #raspberrypi « Adafruit Industries – Makers, hackers, artists, designers and engineers! 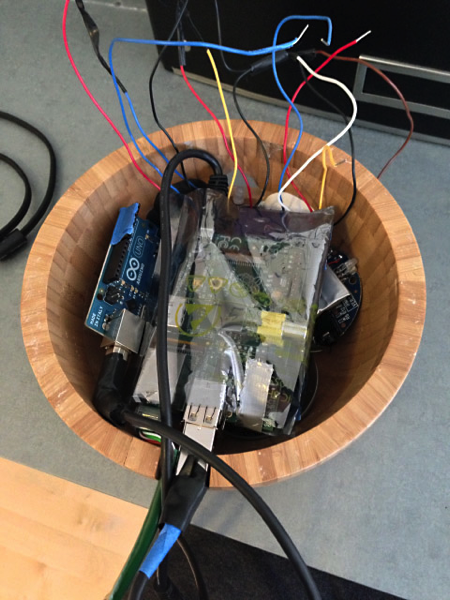 Check out this adorable raspberry pi powered radio built by William Lindmeier. • Speed: The Pi runs at 700 mhz with 512 MB of RAM. I never experienced any latency when making this project. • Audio: Playing audio files is a breeze through the audio jack and supports pretty much any format you throw at it. • Programming: You’re not limited to a specific library or language. I wrote the Magpi software in Ruby to leverage the excellent Twitter gems (twitter and tweetstream). You’ll also notice an Arduino in the diagram, which handled the physical interface (the knobs and light). The reason I used the Arduino in addition to the Pi is because the Pi doesn’t have great support for analog io. I was able to read the volume potentiometer with an ADC chip through the GPIO pins, but because there’s only 1 PWM pin I wasn’t able to control the RBG LED. (If you’re interested in using the Pi’s GPIO pins for sensor io, I’d recommend the WiringPi lib). So the Arduino was connected to the Raspberry Pi with a USB cable to provide serial communication and power. This ended up being quite a challenge, but I eventually stumbled onto this post that solves the problem of communicating with the Arduino over USB. MCP3008 – 8-Channel 10-Bit ADC With SPI Interface – Need to add analog inputs? 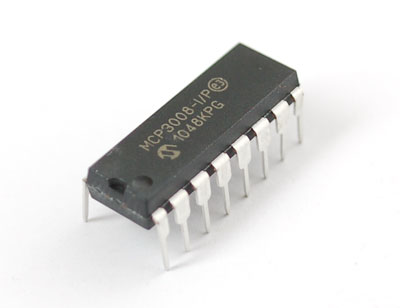 This chip will add 8 channels of 10-bit analog input to your microcontroller or microcomputer project. It’s super easy to use, and uses SPI so only 4 pins are required. We chose this chip as a great accompaniment to the Raspberry Pi computer, because its fun to have analog inputs but the Pi does not have an ADC.